Difference between combined inspiratory and expiratory muscle training in same respiratory cycle or different cycles remained unclarified. We explored the difference between both patterns of combined trainings in patients with COPD. 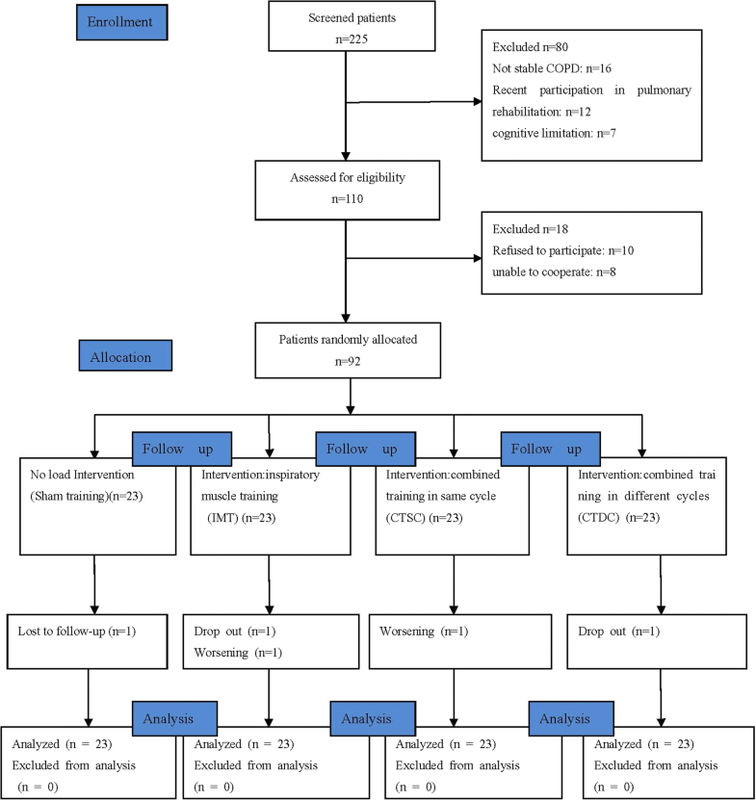 In this randomized, open-label, controlled trial, stable COPD subjects trained for 48 minutes daily, for 8 weeks, using a monitoring device for quality control. Ninety-two subjects were randomly and equally assigned for sham training, inspiratory muscle training(IMT), combined inspiratory and expiratory muscle training in same cycle(CTSC) or combined inspiratory and expiratory muscle training in different cycles(CTDC). Respiratory muscle strength, as the primary endpoint, was measured before and after training. Registry: ClinicalTrials.gov (identifier: NCT02326181). Respiratory muscle training improved maximal inspiratory pressure(PImax), while no significant difference was found in PImax among IMT, CTSC and CTDC. Maximal expiratory pressure(PEmax) in CTSC and CTDC was greater than IMT(P = 0.026, and P=0.04, respectively) and sham training (P = 0.001). IMT, CTSC, and CTDC shortened inhalation and prolonged exhalation(P < 0.01). Subjects with respiratory muscle weakness in IMT and CTDC exhibited greater increase in PImax than those without. IMT, CTSC and CTDC showed no difference in symptoms and quality of life scales among themselves(P > 0.05). Both patterns of CTSC and CTDC improved inspiratory and expiratory muscle strength, while IMT alone only raised PImax. Respiratory muscle training might change the respiratory cycles, and be more beneficial for COPD patients with inspiratory muscle weakness. Patients with COPD generally suffer from respiratory muscle dysfunction . Severe respiratory muscle dysfunction can lead to problems such as dyspnea, hypoxemia, and decreased exercise capacity. Respiratory muscle dysfunction is closely related to the mortality of patients with COPD [2, 3]. Therefore IMT has been suggested as an important solution to decreased respiratory muscle function . It has shown that IMT in patients with COPD can delay deterioration of lung function via increasing inspiratory muscle strength and endurance, which relieves dyspnea, and improves quality of life [5, 6]. However, in addition to impaired inspiratory muscle function, expiratory muscle fatigue may also occur in COPD. Increasing intrathoracic pressure and diminishing lung volume, expiratory muscle contraction promotes effective cough , which has been previously thought to be associated with airway clearance . It is known that expiratory muscles are usually activated at the end of expiration in COPD patients during rest, or weight-bearing breathing . And this helps to maintain respiratory function . Although at present there is a few of researches examining expiratory muscle training(EMT), EMT alone or the combination of EMT and IMT was recommended to strengthen inspiratory and expiratory muscles . Nowadays, few studies are focusing on combined inspiratory and expiratory muscle training in COPD patients, and the effect of combined training remains unclarified. Combined respiratory muscle training has been categorized into two patterns: CTSC(training both inspiratory and expiratory muscle in same respiratory cycle) and CTDC(training inspiratory and expiratory muscle separately in different respiratory cycles). Weiner P  allocated COPD patients to CTDC for 3 months and found it had no additional benefit compared to IMT. In contrast, Battaglia E  connected the target flow inspiratory muscle trainer with the expiratory muscle trainer for CTSC, and found it significantly improved respiratory muscle function in patients with COPD. Presently, it is unclear whether CTSC and CTDC provide additional rehabilitation benefits compared with IMT alone, and whether there are differences between the two patterns of combined respiratory muscle training. Thus, the study was to explore the rehabilitation effects of CTSC, CTDC, and IMT alone, using a modified threshold respiratory muscle trainer with monitoring device which allows inspiratory and expiratory muscle training in same respiratory cycle. As IMT, but not EMT, is the recommended method for respiratory muscle training at present, EMT group wasn't established in this trial. The trial was carried out at Zhujiang Hospital of Southern Medical University from January 2015 to December 2017. The protocol was approved by the Zhujiang Hospital ethics committee(number: 2016-HXNK-005), and consisted with the Declaration of Helsinki. Informed consents were signed and obtained from all the subjects before the trial. Prior to the trial, it was registered on ClinicalTrials.gov (identifier: NCT02326181). Report of this trial was consistent with the Consolidated Standard of Reporting Trials statement . During a run-in period for 2 weeks, Patients with clinically stable COPD , naive to pulmonary rehabilitation and willing to participate were eligible. Patients got excluded if they had cognitive disorders, organ failure, malignant tumors, or metabolic diseases. Of the 225 COPD subjects initially enrolled, 92 subjects were recruited and randomly allocated to Sham training, IMT, CTSC, and CTDC, according to a computer-generated sequence using a simple randomization method (Fig. 1). The randomization list was concealed in sequentially numbered, sealed, opaque envelopes and prepared by an independent physician not involved in subject recruitment. Each new subject was assigned a number sequentially, then the corresponding envelope was opened to decided which group they would enter. Before allocation, subjects learned all kinds of training. Subjects continued their regular medications during the study, and had the right to withdraw at any time. Subjects in all groups trained daily, with each session lasting for 48 minutes per day, 7 days a week, 8 weeks. The training was performed mainly at home, each set consisting of 3 minutes of training and 2 minutes of rest. Sham training performed 16 sets of no-load respiratory muscle training daily. IMT performed 8 sets of inspiratory muscle training and 8 sets of no-load respiratory muscle training per day. CTSC performed 16 sets of combined training in one respiratory cycle daily. CTDC performed 8 sets of inspiratory muscle training and 8 sets of expiratory muscle training separately in different cycles daily. A modified threshold trainer with a monitoring device was used (Fig. 2-A). The modified trainer consisted of a threshold inspiratory trainer(Threshold IMT, Respironics, USA) and a threshold expiratory trainer(Threshold PEP, Respironics, USA), which were connected to a tube (Fig. 2-B) with two one-way valves(pattern ID:CN201721194926.4). Threshold trainers featured with an adjustable specific load . Threshold PEP would be removed from the modified trainer to perform IMT. Threshold IMT would be removed to perform EMT. For sham training, both trainers would be removed. The load range of the modified trainer consisted with Threshold IMT(9-41 cmH2O) and Threshold PEP(5-20 cmH2O). For training management, a monitoring device(pattern ID:CN201620070450.2) was installed (Fig. 2-C). The device recorded daily use including frequency and duration. Before training, subjects connected the device to a wireless terminal (such as a smart phone) through Bluetooth,which recorded daily use. The records were reviewed by staffs weekly. If a subject did not finish the planned assignment, they would take a lengthened training as compensation. Subjects were required to record, if any, discomfort during training. If their situation exacerbated, subjects would withdraw for treatment. Besides, Subjects received follow-up by telephone weekly and in the clinic every 2 weeks. In the clinic follow-up, Staffs checked the discomfort record, re-measure PImax and PEmax for load reset. The inspiratory load started at 30% PImax, and incrementally increased 5% every two weeks until reaching 45% PImax. The expiratory load was adjusted from 15% PEmax plus 5% PEmax every two weeks to 30% PEmax. The primary endpoint was respiratory muscle strength. The secondary endpoints were dyspnea, breathing pattern, spirometry, exercise capacity, quality of life, emotional status, BODE index, and nutritional status. Endpoints were measured before the start of intervention (as baseline) and within 7 days after its completion. All tests were performed by one same experienced respiratory physician blinded to the allocation. Examination of respiratory muscle function consisted of measuring PImax and PEmax with a digital gauge (AZ-8205, AZ Instrument, Taiwan). Maximum value of three available tests that varied by less than 20% was recorded. The interval of each measurement lasted at 30 seconds at least. The lower limit of normal PImax was 60 cm H2O . The modified Medical Research Council (mMRC) dyspnea scale was adopted to evaluate the severity of breathlessness. Breath flow rate was measured using a pneumotachograph (MLT300L, ADInstruments, Australia). Respiratory rate (RR), inspiratory time (Ti), expiratory time (Te), inspiratory time/total breath cycle duration (Ti/Ttot), tidal volume (Vt), and inspiratory capacity (IC) were acquired via calculating the flow rate. Spirometry was measured using a spirometer (PonyFX 229, Cosmed, Italy) which was calibrated daily according to the 2014 ATS guidelines . Forced expiratory volume in one second (FEV1), percent-of-predicted FEV1(FEV1%), forced vital capacity (FVC), and FEV1/FVC were recorded before a bronchodilator test. Exercise capacity was assessed with 6-minute walk test (6MWT). During the test, heart rate and blood oxygen saturation were monitored by pulse oximetry. Oxygen saturation of all subjects was maintained at more than 90%. Quality of life was reflected by St George’s Respiratory Questionnaire (SGRQ) and COPD Assessment Test (CAT) ; Hospital Anxiety and Depression Scale (HADS) were used for evaluation of emotional status. Nutrition was reflected by BMI (body mass/height2) and FFMI (fat-free mass/height2). A FFMI ≤ 15 kg/m2 in women and FFMI ≤ 16kg/m2 in men was defined as low FFMI. The BODE index consists of BMI (B), airflow obstruction (O), dyspnea (D), and exercise capacity (E), which was used for a comprehensive evaluation of the subjects. A value of P < 0.05 was considered statistically significant. For subjects who withdrew, an intention-to-treat analysis was done. The last observation carried forward method was used for data filling. Data were presented as mean ± standard deviation (SD) or mean ± standard error (SE) and analyzed via SPSS 20.0 (SPSS Inc., Chicago, USA). One-way analysis of variance (ANOVA) was applied for baseline comparison. A covariance analysis (ANCOVA) was adopted to analyze the differences (after minus before, shown as Δ) of each index, and models of least-significant difference were used for the baseline analysis. Differences in breathing patterns among groups and pre- and post-test comparisons were analyzed using mixed linear model. Subgroup analyses were performed using two-way ANOVA. Ninety-two subjects initially participated in the study, but five dropped out. One subject in Sham training was lost to follow-up. Two subjects in IMT discontinued due to intolerance or deteriorated respiratory function, respectively. One in CTSC dropped out because of deteriorated respiratory function. One in CTDC was lost to follow-up. Basic data of all 92 subjects was not significantly different before the training (P > 0.05) (Table 1). As shown in Table 2, the ΔPImax of IMT, CTSC, and CTDC group was significantly greater than Sham training (P < 0.05), but was not different among IMT, CTSC, and CTDC. Improvement of PEmax in CTSC and CTDC group was larger than IMT group (P = 0.026, and P = 0.04, respectively), and Sham training (P = 0.001), but CTSC was not significantly different from CTDC. No significant difference was found in the improvement of PEmax between IMT and Sham trainig (P = 0.218). The ΔmMRC of IMT, CTSC, and CTDC group were significantly improved compared to Sham training(P < 0.05). However, no significant differences among groups was shown (P > 0.05) (Table 2). As shown by Table 3, no significant difference was found among groups. After training, there was no significant change of breathing pattern in Sham training. CTSC, CTDC, and IMT were characterized by a decrease of Ti and Ti/Ttot, and an increase of Te, but there were no significant differences in Vt and IC. In addition, respiratory rate in CTSC group significantly reduced. No significant changes were observed in ΔFVC, ΔFEV1, ΔFEV1%pred, ΔFEV1/FVC, and Δ 6MWD among groups (P > 0.05) (Table 2). ΔSGRQ and ΔCAT indicated changes in quality of life. The ΔSGRQ and ΔCAT of IMT, CTSC, and CTDC were notably lower than Sham training (P < 0.05), but no significant difference among groups was found (P > 0.05). In addition, there was no significant difference in depression and anxiety scores among groups (P = 0.559) (Table 2). Compared with Sham training, no significant improvements was observed in BODE index, BMI, and FFMI in IMT, CTSC, and CTDC groups (P > 0.05) (Table 2). Each group was divided into two subgroups according to respiratory muscle strength, and then a subgroup analysis was performed. Respiratory muscle weakness was defined as PImax < 60 cm H2O. As reported in Table 4, subjects with respiratory muscle weakness in IMT group benefited more in PImax than those without (P = 0.009). CTDC exhibited a benefit for PImax and PEmax (P = 0.038 and P = 0.007). There were not differences before and after training in all endpoints of CTSC and sham training (P > 0.05), except ΔFEV1%pred in CTSC. In this study, two patterns of combined respiratory muscle training, CTSC and CTDC, were compared. Both groups were not significantly different in almost all endpoints, except the significantly reduced breathing rate in CTSC. Similar to Battaglia E , our trial also found that combined respiratory muscle training could strengthen inspiratory and expiratory muscle. In Battaglia’s work, patients received home based training twice daily for 15 minutes, 7 days a week, for 12 months with a target flow respiratory muscle trainer. The increase in PImax and PEmax was not significant until 6 months after training. However, in our study, the effects were significant after 8 weeks in CTSC and CTDC. As a target flow trainer usually requires a specific inspiratory flow which depends on breathing pattern, the outcomes may fluctuate. Nevertheless, a threshold pressure respiratory muscle trainer, independent of the flow, can regulate the training intensity precisely , making it more useful. Watsford M  applied the Powerlung device to explore the effect of CTSC on the recovery of healthy people. They adjusted the training load in accordance with subjects’ endurance, and discovered that CTSC could significantly improve both PImax and PEmax. Training loads of at least 30% PImax were required to improve respiratory muscle strength . But no standard of load exists for expiratory muscle training. In our study, we used 15% PEmax as an initial load  and then the load raised incrementally, which gradually increased endurance of subjects. The improvement of PEmax in CTSC and CTDC were significantly better than IMT in our work. Similarly, Weiner P  found IMT alone could not enhance expiratory muscle strength. Increased expiratory load was assumed to induce a larger end-expiratory lung volume (EELV) . Therefore, expiratory muscle training might worsen dynamic lung hyperinflation through increasing EELV in COPD patients. But another research stated that expiratory load was not associated with lung hyperinflation . EELV, or even dynamic pulmonary hyperinflation can be reliably reflected via IC . No significant change in IC occurred in each group, which meant EELV did not change significantly after training. The mechanism behind airflow limitation with expiratory muscle recruitment has been yet completely clarified. Contraction of expiratory muscle during exhalation might be a nonspecific response to increased respiratory stimulus . Despite lung hyperinflation, Abdominal muscle recruitment during expiration preserves fiber length and force-generating ability of diaphragm muscle for the onset of inhalation . Therefore, inspiratory muscle may get fatigue if expiratory muscle dysfunction occurs. Through recorded breathing pattern, it’s a pity that we didn’t find any difference in breathing patterns between groups. But the pattern in CTSC, CTDC, and IMT was characterized by a decrease of Ti and Ti/Ttot, and an increase of Te. Prolonged exhalation probably relieves dyspnea by decreasing dynamic pulmonary hyperinflation . A reduction in Ti/Ttot might increase diaphragm blood flow , thus taking more oxygen to important inspiratory muscles in diaphragm. But no difference was observed in VT of each group after training, and this may result from increasing contraction velocity of inspiratory muscles to maintain VT . Different from CTDC, respiratory frequency of CTSC was significantly lower after training, which may be due to differences in the physiology among the groups. Neuromechanical dissociation was a popular theory to explain the dyspnea caused by respiratory muscle dysfunction . Dyspnea-associated physical activity limitation is a common complaint in COPD patients with moderate to severe airflow obstruction. Avoidance of activity to relieve dyspnea leads to a sedentary lifestyle, which ultimately causes a decline in exercise capacity. Because of inspiratory muscle fatigue and inefficiencies, COPD patients might use a high proportion of PImax to inhale, which might contribute a greater sense of dyspnea . Held HE  suggested increase of expiratory muscle strength is beneficial to relieve dyspnea and improve quality of life. Therefore, combined respiratory muscle training helps to relieve dyspnea. In the current study, degree of dyspnea in CTSC, CTDC, and IMT group decreased, and respiratory muscle strength of these groups increased by different degrees. This indicated that respiratory muscle training can relieve dyspnea in COPD patients via strengthening their respiratory muscle. Decreased quality of life is a predictor for mortality and rehospitalization in COPD . Studies have shown that both inspiratory and expiratory muscle training can improve quality of life in patients with COPD [8, 33]. We found that the improvement of SGRQ and CAT in CTSC, CTDC, and IMT was significantly greater than Sham training, probably owing to larger reductions in dyspnea after respiratory muscle training. Though there was no differences among CTSC, CTDC, and IMT. A study showed that the correlations among SGRQ, CAT, and mMRC were strong . Therefore, dyspnea relieving from respiratory muscle training was beneficial to the amelioration of SGRQ and CAT. No significant benefits for spirometry were found from respiratory muscle training. This might be related to the incompletely reversible airway obstruction and emphysema. On the other hand, It is well known that lower limb muscle dysfunction is a leading cause of decreased exercise capacity . Many researchers found IMT helpful in restoring the exercise capacity of patients with COPD, but the effect didn’t reach clinical significance [5, 35, 36]. We also observed no remarkable changes in exercise capacity. It was recommended that, to enhance exercise capacity, inspiratory muscle strength should increase at least by 30% from the baseline level , according to which it is rational to observe no significant improvement in exercise capacity in our work. Subjects with inspiratory muscles weakness in IMT group and CTDC group exhibited greater increases in PImax, suggesting that respiratory muscle training may be more beneficial for COPD patients with impaired inspiratory strength, similar to a prior meta-analysis . But no change was noted in CTSC group. It may result from some unknown physiological mechanisms, or it just takes longer for the change to become evident. One major limitation of this study was that it was relatively small size. Due to the limited size, subgroup analysis could not be done in each group based on the revised ABCD assessment tool in 2017 Global Initiative for COPD . Despite these, to the best of our knowledge, this is the first randomized controlled trial to compare combined respiratory muscle training in same respiratory cycle and different cycles with monitoring device in COPD patients. Although the monitoring device could not record threshold load, it provided reliable quality control for the training. Monitoring device enabled us to make sure that subjects finished their training as possible, thus offering a stable rehabilitation. Although the sample size was not enough for subgroup analysis, more subjects were included in our study compared to previous researches. Besides, we also used new indicators on nutrition, quality of life and breathing pattern. Even though we could not find the better training between CTDC and CTSC, we nevertheless provided evidences about combined respiratory muscle training. The effects of combined training on patients with different inspiratory muscle strengths would assist healthcare providers in establishing individualized respiratory muscle training program. In this trial, we found that two patterns of combined trainings could strengthen both inspiratory and expiratory muscle, while IMT alone did not change PEmax remarkably. We also showed that respiratory muscle training might improve the breathing pattern of patients with COPD, and the effect was more remarkable in patients with inspiratory muscle weakness. As breathing frequency in CTSC group was reduced significantly, it is needed to explore physiological mechanisms among different trainings. This study suggest that patients may benefit more from both patterns of combined trainings than IMT alone. Wenhui Xu, Rui Li and Lili Guan contributed equally to this work. Special thanks to Dr. Junfang Liu, who was in charge of the concealment and assignment as third party. The staffs are also grateful to all subjects for their participation in the research. Permissions to acknowledge were obtained from all those mentioned above. This work was funded unconditionally by Clinical Research training program of Southern Medical University (LC2016PY032), National Key R&D Program of China (2017YFC1310601), The Guangzhou Healthcare Collaborative Innovation Major Project (201604020012), Guangzhou Innovation and Entrepreneurship Education Project of Universities (201709T26), Special Funds for the Cultivation of Guangdong College Students’ Scientific and Technological Innovation (PDJHB0101). The sponsors have no any role in design, conduct, data interpretation of the study, and preparation, review or approval of this manuscript. The datasets, as well as the patent materials, used and analyzed during the current study are available from the corresponding author on reasonable request. XC is the guarantor of this research. RC, XC were responsible for study concept and design. WX, RL, LG contributed to patient recruitment and patient follow-up. KW was responsible for outcome measurement. YH, LX finished data acquisition. LZ finished data analysis. All authors contributed to the drafting of this manuscript. All authors read and approved the final manuscript. Prior to its start, the study protocol was in accordance with the Declaration of Helsinki, and approved by the ethics committee of Zhujiang Hospital, Southern Medical University, Guangzhou, China. The reference number for the study is 2016-HXNK-005. Informed consents about the study procedures were signed and obtained from all the subjects before the trial.